Talk about a vibrant meal! We spent most of the weekend at home, unwinding from the jetlag that comes with West Coast to East Coast travel, and cooking! But also doing some house renovation work outdoors. We came back from working in California on different days, and although the weather is not nearly as gorgeous as it was in LA, we were greeted with some temperatures in the 50's that made exterior work seem very appealing. Speaking of which- in case you missed it, we just spent a long weekend in Palm Springs and fell head over heels in love. *You can see the travel post here! Robert had a couple of days hanging out at home before traveling again on a few back to back photo jobs, and he's always so concerned that I won't cook enough for myself (it's true, there's a good bit of sad kale salad, GF pizza and omelettes when he's away for a while) that he decided to make some meals that would produce ample leftovers. About three times more than a single person would need, naturally, and it seriously melts my heart that he thinks that way. Even when I tell him I'll be fine, it's hard to stop him from making *just one more* thing *just in case! * I need it. 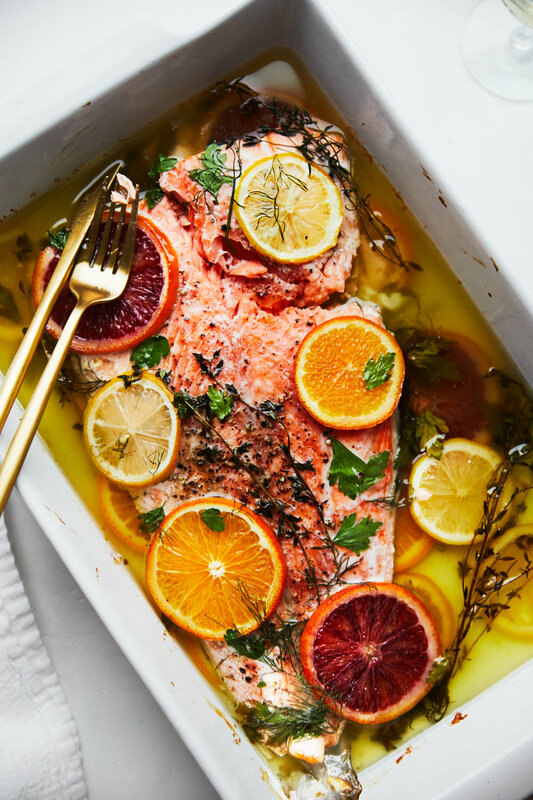 When we stumbled across this Slow Roasted Citrus Salmon recipe from NY Times Cooking, Robert wanted to make it immediately. 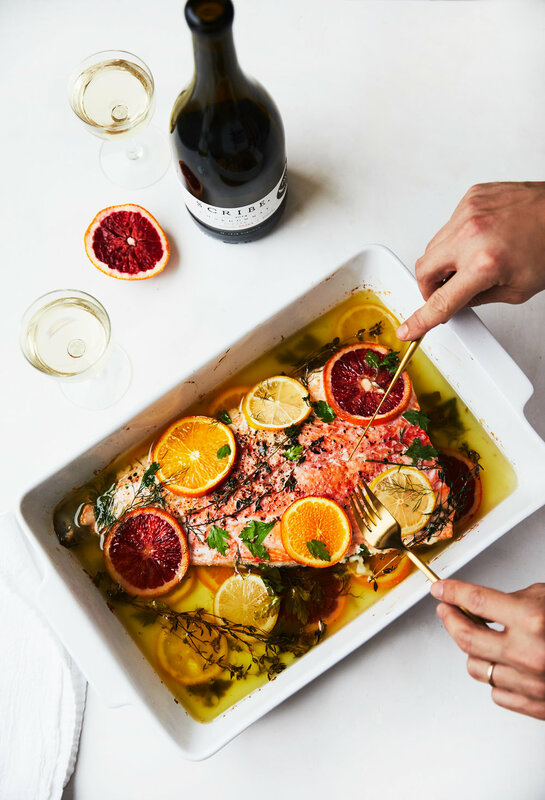 We bookmarked it for Sunday dinner, but honestly this is so low-maintenance that it would be perfect for a weeknight, when time is not as plentiful and you're looking for something that's healthy and easy to throw together. I'm also very interested in making it again for dinner with friends. 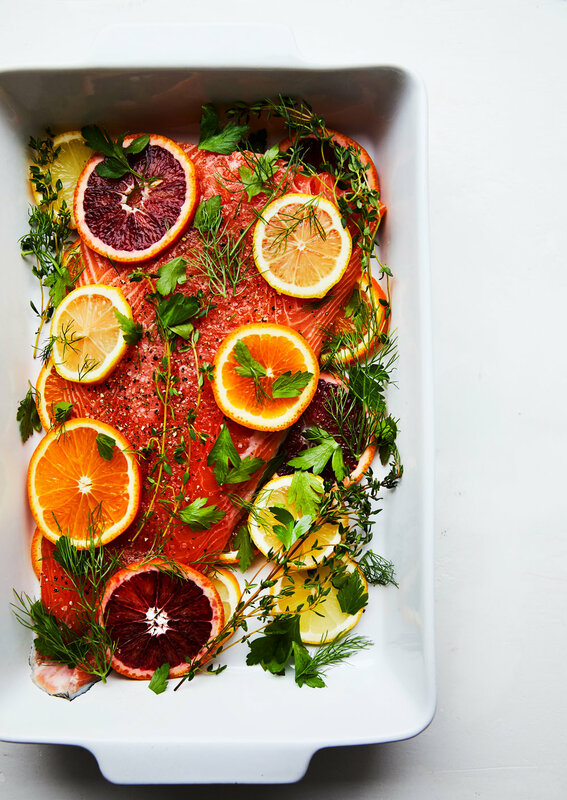 It just looks so naturally gorgeous, with the mix of blood orange slices, lemon slices, and fresh herbs. The salmon falls apart the moment you cut into it, and I had to stop myself from eating the entire filet. Leftovers are rarely this exciting! 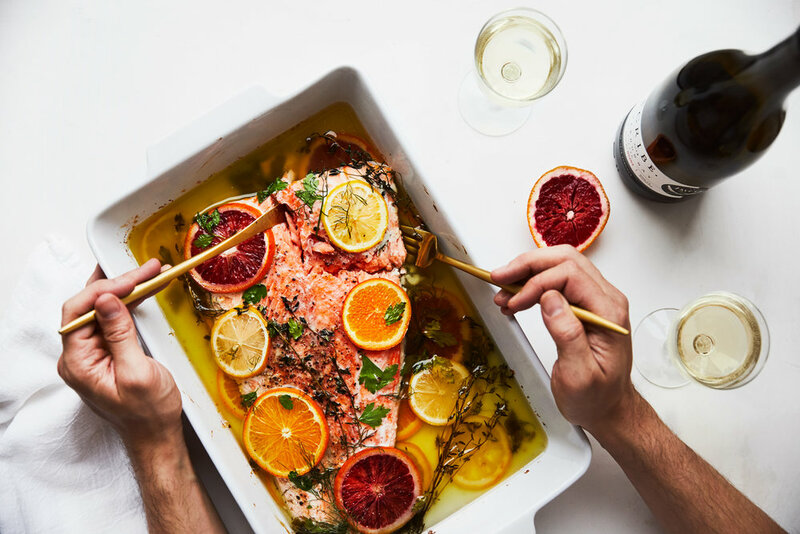 Especially if serving for a crowd, a wine pairing here really elevates the flavor. We paired this with a Chardonnay from Scribe Winery, a crowd favorite of ours. We're part of their wine club, and I have to say... best wine related investment we've ever made. We get so excited when the shipments arrive, since it's pretty hard to find their wines on the East Coast. 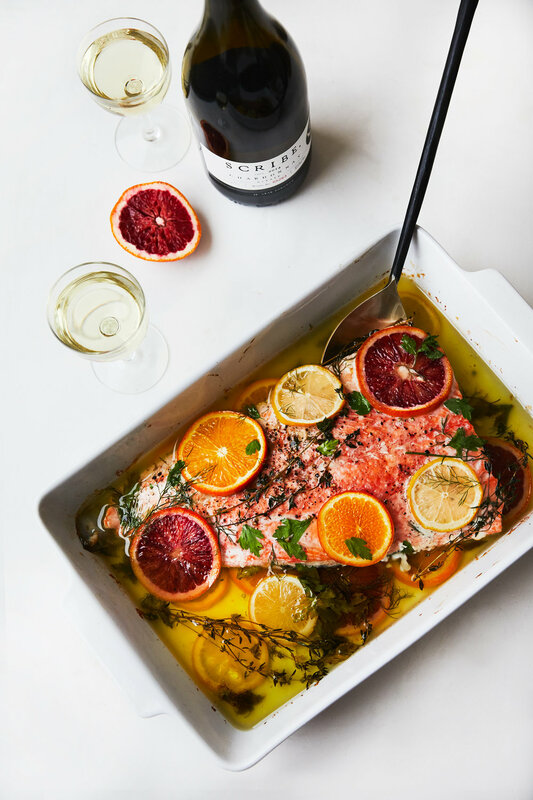 Some easier to find options for pairing would be an unoaked Chardonnay, or medium body white- like a Vouvray or Pouilly-Fuissé. Heat oven to 300°. 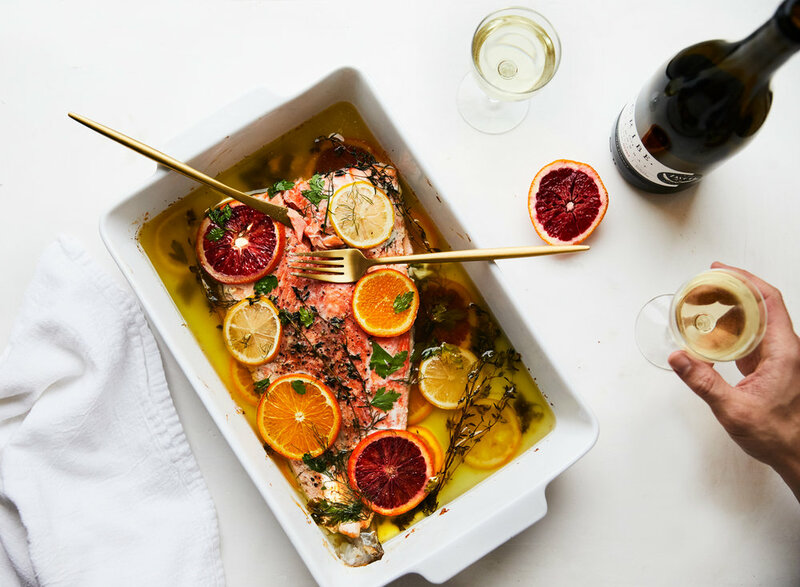 Season salmon with salt and pepper on both sides. 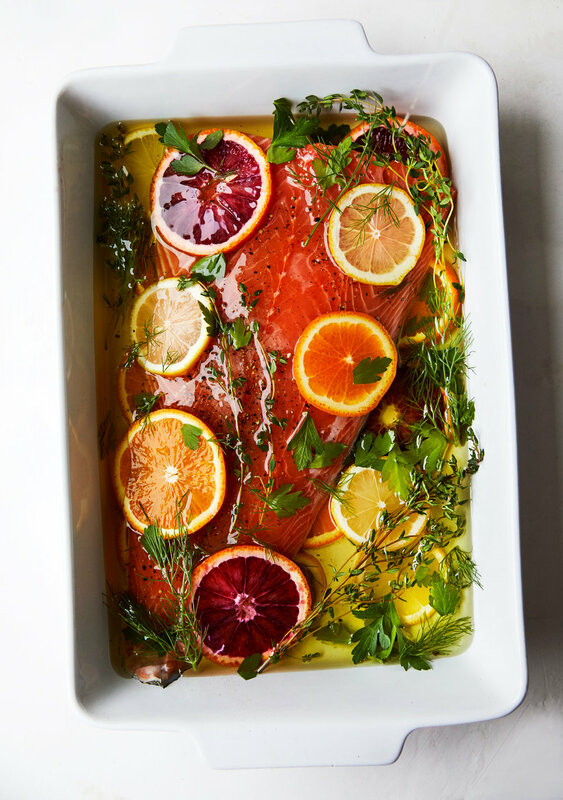 Place in a large baking dish with sliced lemons, oranges and herbs. To serve, season with additional salt and pepper, fresh parsley and a squeeze of lemon juice.